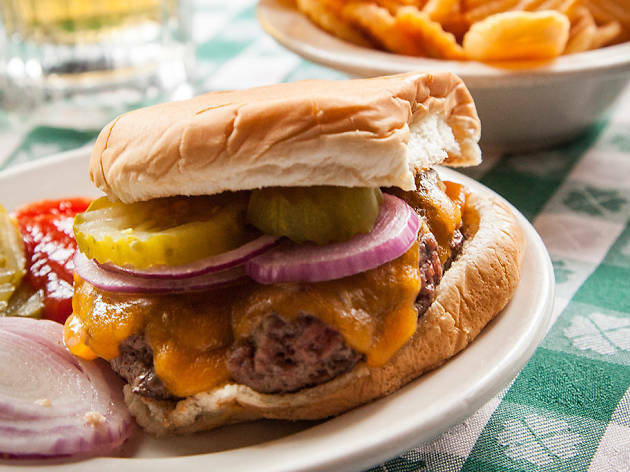 New Yorkers love to bestow cult status on their favorite haunts, from century-old dive bars to mystery-meat street carts and yes, Irish burger joints. Among the latter is Upper East Side patty icon, J.G. Melon, whose simple menu and old-school ambience have drawn in both locals and destination-seeking visitors for over 40 years. 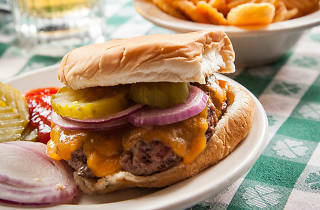 These days though, bar-goers and burger fanatics need not trek to the 74th Street to get their fix. Just over a year ago, longtime manager Shaun Young partnered with Danny Abrams (The Mermaid Inn) and Steve Abrams (Magnolia Bakery) to bring that classic uptown experience downtown to the bustling MacDougal Street. From menu to decor, the new location strives to stay true to the flagship. Pulled straight from the original, that hallmark cheeseburger ($12.25) remains both more reasonably priced and less embelished than chef-driven renditions that have become de rigueur at new hotspots, accompanied only by thinly sliced pickles, red onion, sliced tomato, and lettuce. Add a side of cottage fried potatoes ($6), and the value proposition is not quite as favorable, but the burger arrives just as ordered, and the fries—essentially crinkle-cut potato chips—boast the ideal amount of salt and crunch. What remains unclear at the new iteration of J.G. Melon is whether it is meant to be primarily a restaurant or a bar. While the number of tables would suggest the former, the number of finance types and country club-goers nursing pints of Founders IPA ($7) say otherwise. In any case, those who stay long enough will invariably order the burger, and those who are there for the food will give themselves away by putting away the chocolate cake or signature banana pudding from Magnolia Bakery (both $8.95). Despite having a longtime staff member on hand, the downtown JG Melon struggles to embody the classic experience of the original. While the burger is admittedly familiar, one has to feel as though the gimmicky, old-school look (watermelon paraphernalia, green-checkered tablecloths) is recreated too precisely and deliberately to feel authentic. Still, it's a fitting tribute to its inspiration, and a solid bet in an area where trendier spots command hour-long waits. I am definitely biased when I say I like this location better than the original. I live fairly closeby. I know JG Melon in the UES is an institution, but I find it to be too crowded and the host just not that pleasant. This location is more spacious, the burgers equally tasty, and the service 500% more friendly. Anyway, foodwise - can't go wrong with their burgers of course. I usually get a cheeseburger, and depending on how I feel, I may add mushrooms. The burger MAY look smallish when it comes out, but don't be deceived. It's actually very filling. Don't skip the fries on the side!